This air quality monitor for multi-function board,built-in high-speed 4 nuclear 64 - bit processors, used high precision sensors,adopts world-advanced processing technology. This monitor for civilian products do not compared with specialized experimental instrument. This monitor can detect: temperature, humidity, HCHO, TVOC, PM2.5, PM10, toluene and other harmful chemical volatiles and pollutantin the air, carbon monoxide, smoke,fog, dust, alcohol, glue, paint, ink,such as perfume, all have good detection effect. Power supply: The product without rechargeable battery,needs to connect plug and keep charging all the time. If you need to move to other places to measure, you can use a power bank to supply. Key signs or symptoms maybe associated with bad air: Conjunctival irritation, nose and throat discomfort, headache, allergic skin reaction, dyspnea, declines in serum cholinesterase levels, nausea, emesis, epistaxis, fatigue, dizziness and so on. 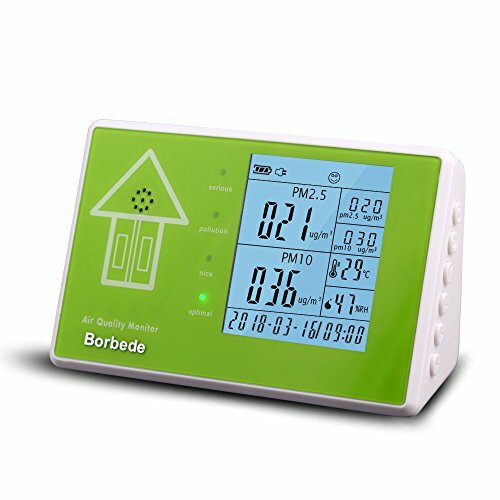 If you have any questions about this product by Borbede, contact us by completing and submitting the form below. If you are looking for a specif part number, please include it with your message.